The MRV316 is Nova's new receiver card with a single card carrying 512 x 256 pixels. The MRV316 supports color correction by lighting, eliminates chromatic aberration, significantly improves LED display consistency, and brings more detail to the user. MRV316's hardware design and software design fully consider the scenarios of user deployment, system operation and maintenance, making deployment easier, running more stable, and maintaining more efficient. 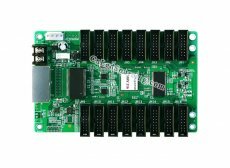 Integrated 16 standard HUB75 interfaces, free from HUB board. With a Gigabit Ethernet port, you can connect to the PC. Supports receiving card pre-screening settings. Support temperature, voltage, network cable communication and video source signal status detection.